I don’t miss having a car, but from time to time we succumb and rent one. For one thing, we need to keep up our skills, and we also find it handy for certain shopping trips. Plus it’s necessary to have a car to see some of the more rural sites not efficiently served by train or bus. So a few weeks ago we targeted the Labor Day weekend for some daytrips and shopping, planning to rent a car. Because our little neighborhood Hertz franchise closes from 1:00PM Saturday until 8:30AM Monday, we need pick up the car on Saturday morning. So we planned a few adventures: a trip to Villa d’Este in Tivoli to see it at night, which is only possible a few nights each summer; a shopping trip to IKEA; a daytrip to the hill town of Cività di Bagnoreggio, which is hard to reach by bus. Then Ric got roped into working Saturday and Monday, so we curtailed the plan to go to Cività. Oh well. 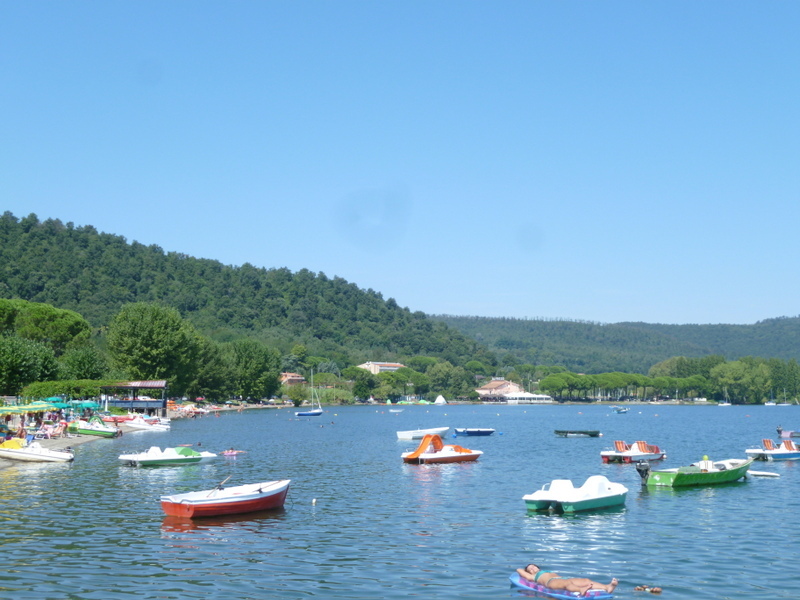 Freshwater lake in Lazio, peaceful, uncrowded, great lakeside dining. Summer is waning so although Ric had worked a long day Saturday, in the evening we set off for Tivoli with a Google Map printout in hand, the name of a very good restaurant, and high expectations for Villa d’Este. But thanks to the genius of Italian street signs and the inefficiency of the GPS on my phone, we never found Villa d’Este nor the restaurant. The street signs have two points of failure: street names do not correspond to what Google Maps says they should be, and the “way-finding” signs are impossible to follow. I would turn in the direction pointed to by a neat little Villa d’Este sign, then turn at another, and then see nothing. No further directional, no entrance signs, no parking lots, lots of dark streets. So I would come around and try again. Nothing. I asked locals and they pointed in what (to them) was an obvious direction. But nothing. Maybe we are idiots but with both of us searching high and low, we could not find this place. I resorted to the GPS on my phone which has gotten us out of jams in the past, but she insisted we drive down a limited access street into a Zona Traffico Limitato, which would carry a huge fine. By this time, we’d been in the car about 90 minutes, Ric was tired and cranky as a toddler, so finally we settled on a place to eat – I would rate it as OK – and once fortified tried again to find our star attraction. Still unable to find it, we headed back to Rome, where apparently we should have stayed for this evening. I seldom get lost walking. 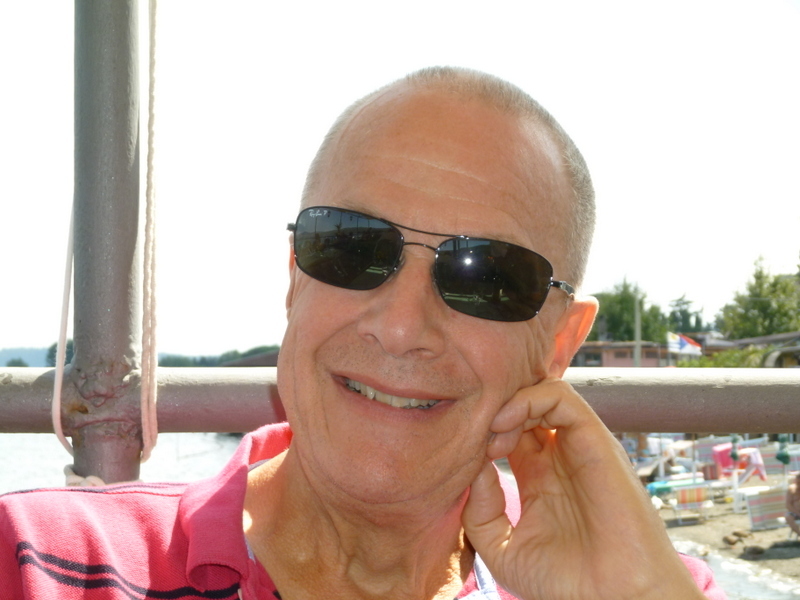 Cute guy I had lunch with at Lago di Bracciano. On the bright side, we got to IKEA before the crowds on Sunday, then headed north to a lake I’d read about, Lago di Bracciano. Here we found a quiet freshwater beach scene with excellent lakeside dining. We did not get lost and had a fine lunch. I had a broiled freshwater fish called coregone, which is much like some of the types in lakes in the Midwest of the U.S., and Ric had a fritto misto that included a large number of what looked like whole fried minnows. We certainly used a lot of minnows as bait for fishing in Minnesota but can’t say I ever saw them in a Friday fish fry. These were very tasty, but we got the giggles to think of eating minnows. It’s not surprising that the GPS in your phone was “less than ideal” in finding your destination. I’ve found on numerous occasions that while GPS units in phones can be useful at times, they never seem to work as well as my dedicated Garmin Nüvi. I always pack a GPS on trips to Europe, as it’s been a valuable travel accessory both for driving and walking and I never have to worry about data charges. Glad your weekend wasn’t a total loss. The lake is beautiful and very peaceful looking. There’s always something redeeming. At least I got a good blog entry out of it, and time with my sweetie! Always love hearing about your adventures. I will write more when I have a moment. Leaving Portland October 11. Oh, Kim, Portland is the poorer for your leaving. It will not be the same without you guys there. Maybe we’ll have to stay in Italy. Please please please keep us updated! Maybe that’s why the busses don’t go there….they cannot find it!~! Ha! Nice try at making me feel less idiotic! Oh, I’m so glad someone else finds driving in Italy…interesting…an adventure…impossible! 😉 We rented a moped in Rome last time we were there. After going around the Coliseum a stupid number of times (because all roads lead to Rome…or the Coliseum) we then proceeded to the Appian Way which was lovely but terrible on the spine on a moped! On our way back, thinking we were headed into Roma Centrale via signs??? we ended up in the Italian countryside miles and miles from any civilization! Too funny but truly an adventure (in our minds.) The critical part is the traffic. You may want to turn left but that doesn’t mean the traffic or the road rules allow it! But, hey, your in Italy…IT’S ALL GOOD! Oh Terah, you make me feel so much better about “missing” Villa d’Este! Parking is also such a nightmare when you have a car. Romans are very brave parkers and have no fear of putting their cars on sidewalks or whatever, but y over-trained American self like order and clearly designated parking spots. Next time we’ll take the train to V.d’Este…in the daylight!